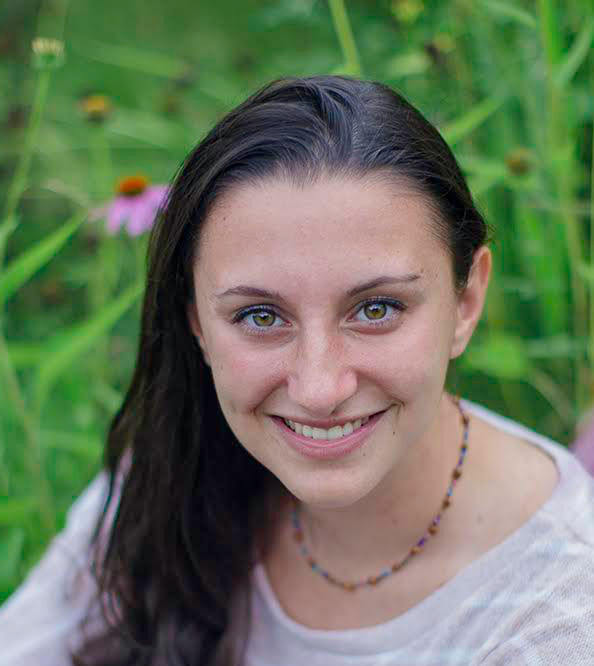 I published this interview with Leah Wenger two years ago today on my blog for The Mennonite under the title Moving beyond the belittlement of the youth: An interview with Leah Wenger. Glen Guyton and other Mennonite Church USA convention staff rose to Leah’s challenge and worked with Leah and others to launch the Step Up program at the convention in Orlando this past summer that invited 3 youth from each Mennonite conference to the delegate assembly. 1. What led you to attend the Mennonite convention in Kansas City? I have always loved spending time with my youth group, and that was one of the main things I was looking forward to in going to Kansas City 2015. I love spending time with this group of people that I would not hang out with normally. We are truly a group with no judgment, and always have been, so I never feel like I have to be someone else. We have such a strong connection as youth at CMC, and I was looking forward to building that connection throughout the week. I was also looking forward to simply being in the Mennonite realm for a week. I was excited to be together with all these people as so many different parts of the same body of Christ. I wanted to be there to renew my faith in God and in the Mennonite church, and to remind myself about how incredible of a privilege it is to be a part of a family of faith such as this. I wanted to find a place where I felt the spirit moving in a large way. Anabaptist Missional Project, a group of young leaders in the Mennonite Church, hosts its second annual gathering June 30-July 1, at Oxford Circle Mennonite Church, Philadelphia, PA. Leonard Dow, Madeline Maldonado and David Maldonado will lead conversations that focus on the Spirit’s work in the growing diversity of MCUSA. Proclaiming the gospel of Jesus Christ brings diversity. Now what will we do? More details and registration are here. See YAR coverage of their first annual gathering last year. Time is short … until 1700 years shall have been completed! No actually, I don’t want to talk about the past, but rather about how a past event is being overcome by the present and future! This October it will have been (note the future perfect tense! ), yes this October the 28th of 2012 it will have been 1700 years since Constantine won the battle of the Milvian Bridge bearing on his standard the sign of the cross. He raised the severed head of his enemy on a spit as a sign that the “Christian god” had shown him favour. So, you have read about intentional community in Shane Claiborne’s The Irresistible Revolution years ago and new monasticism has now become a part of your everyday vocabulary. Maybe you are nearing the end of your college career, or maybe you are facing another life transition and wondering how to integrate your values in to those exciting next steps. In other words, what now? Or, perhaps you are someone who has been living “in community” for some time now, but the experience has increased your skepticism and cynicism rather than given you new life-giving perspective. Your expectations were not met, probably because you carried too many expectations with you. Your impression of “community” has officially been sobered. As Bonheoffer says in Life Together, the earlier a community can let go of its wish dream, the better for the community. As the new millennium dawns, anabaptists do a new thing in the city: Build a communal neighborhood populated by tens of thousands of simple-living sectarians. The project is initiated by the Bruderhof and some Old Order Amish, partly for practical reasons: (1) the Amish and Bruderhof population explosions, making it necessary to continually branch out and establish new settlements; and (2) the shortage of affordable farmland, making it difficult to maintain a rural way of life. More importantly, the initiative stems from a “quickening” amongst these plain people, who realize they’ve lost their ancestral impulse for going into the marketplaces & street corners, inviting others to become co-workers in God’s kingdom. They also realize geographical isolation no longer protects them against worldly influences. So they branch out to the Bronx, where they can influence the world instead. According to my Gran, there used to be lines of starving, emaciated men waiting in queues patiently to find work. Nowadays, the young don’t even want to work. In the old days you would never have gone out if your parents told you to stay in, nowadays kids have no respect. They’re not starving, they’ve got loads of stuff – they’re just greedy, lazy and selfish. Last Friday, the city of Philadelphia handed out eviction notices to Occupy Philadelphia, notifying the residents that they had to leave by Sunday at 5pm, or they would be removed. While, I haven’t been a part of this movement, I’ve been observing them from the edges. And, when I heard about the eviction, I was anxious. I saw the UC Davis footage, I read stories about violent evictions in other cities—I was worried about Occupy Philadelphia. The Interfaith Clergy group called on Philadelphia pastors to go to City Hall on Sunday night, to stand as a witness and reminder that we are called to the way of peace. So, my colleague and I headed downtown. It was obvious that we were clergy—some people would walk by us, and thank us for coming, but mostly we were relegated to the edges of the event. We were marginalized, and that was ok. We were observers, not participants. When the Eagles football game let out, we saw more movement around the Occupy Philadelphia encampment. Disappointed sports fans were coming up from the subway, and streaming into the square. Many were intoxicated. 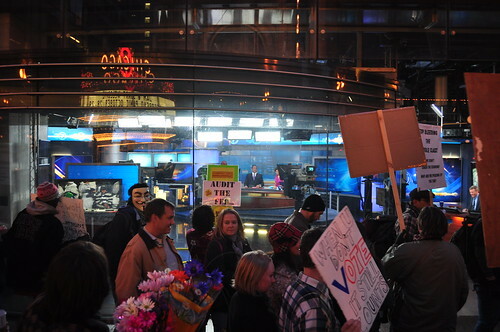 A few were very angry with the Occupiers. One group of young men concerned me right away. I heard them making plans to pick a fight with the protestors, to get themselves on the news. They were convinced that they would be hometown heroes. It’s been a month since I wrote a piece on Young Anabaptist Radicals about my experience of visiting Occupy Chicago. It was three days after they had started camping in front of the Federal Reserve of Chicago and 10 days after Occupy Wall Street (OWS) kicked off in New York. At the time, I wrote with a mix of enthusiasm and skepticism. The visit gave me a glimpse into the sense of possibility that I remember from watching the Seattle protests but also a dose of skepticism bordering on cynicism. What could such a small group of people really do? A month later, the answer seems clear: plenty. It still seems miraculous in many ways. While announcing the death of apathy and despair in the United States (as Michael Moore did at Occupy Oakland on Friday) is probably premature, the OWS movement has gone a long way towards tearing down the barriers that prevent so many of us from working together for change. The Anabaptist movement emerged largely among the young. It moved through the urban contexts of educated Europeans without clarity but with a clear bent toward justice for the poor. It emerged in and around the Peasant Revolts, which threatened established governments and religious perspectives. The radical Anabaptists were sympathetic to those whose lives were controlled by overlords. Early Anabaptism was a movement of conversing, addressing powers and protesting. It was met with ridicule and with sympathy. There were dialogues and diatribes. Crossposted from As of Yet Untitled. 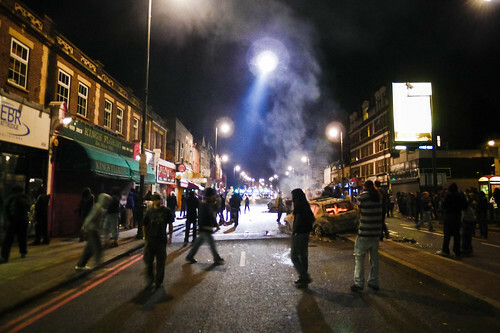 Last week, riots and looting moved through neighborhoods in London that I know well. The broken windows, fires and shouts of “I want a satnav*” were juxtaposed with a familiar map that I bicycled through to work for nearly two years. I found myself turning to Facebook to reach out to friends in those neighborhoods and processing my thoughts through comments on my favorite blog.